Brisbane developers Flynn Property Group and Scott Flynn Properties have signed a $78 million contract with Watpac Limited (Watpac) for the construction of their $150 million hotels and conference centre development at Brisbane Airport. The development, which will feature the 5-star Pullman Hotel, 3.5-star Ibis Hotel and the Brisbane Airport Conference Centre, sets a new benchmark as the airport’s biggest external development. Flynn Property Group Managing Director Anthony Flynn said he and joint venture partner Scott Flynn from Scott Flynn Properties were delighted to have Watpac on board to deliver this landmark Brisbane Airport development. “Not only is this $150 million development the biggest third party development project ever undertaken at Brisbane Airport, it’s arguably the best hotel opportunity on the east coast of Australia,” Mr Flynn said. “It’s strategically located at the centre of a bustling airport with exposure to more than 22 million passengers annually and is highly accessible from across Brisbane by road and rail,” he said. Set on 7,826m2 of prime airport real estate in the Domestic Terminal Precinct on Dryandra Road with panoramic views, the development will include a mix of 373 suites across both Accor branded hotels, as well as 1,735m2 of conference, meeting and event space in the connecting conference centre. With site preparation and major works due to start in May 2015, construction will continue through to April 2017 and is expected to create an estimated 1,000 jobs during this time. 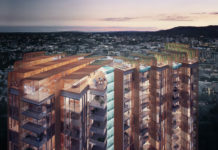 Watpac Limited Managing Director Martin Monro said the Group is extremely pleased to be working with Flynn Property Group and Scott Flynn Properties to deliver this development. 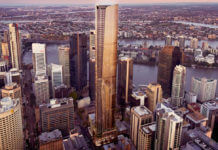 “We are proud to be involved in the delivery of this exciting project which will shape what is essentially the gateway to Brisbane,” Mr Monro said. Positioned for the top-end and executive traveller markets, the 10-level Pullman Brisbane Airport will feature 130 rooms including two presidential suites and 10 junior suites, an upscale restaurant and lounge bar, leisure and lap pools, an executive club lounge and business centre. It will be Brisbane Airport’s first 5-star hotel and the first purpose-built, branded 5-star hotel built in Brisbane in over a decade. The adjoining nine-level Ibis Brisbane Airport will offer 243 rooms, including 99 superior rooms, alfresco dining and a stylish roof top bar with unbeatable views across the airport to Moreton Bay, the CBD and Brisbane suburbs. Capping off the two-tower hotel development will be the Brisbane Airport Conference Centre. This Centre will be capable of hosting up to 600 delegates across 13 conference and meeting rooms, including a 300 seat pillar-less ballroom, boardrooms, business centre, cloakroom and generous breakout terraces. The development is the Flynn brothers’ second hotel investment at Brisbane Airport. Their first, the 157-room Novotel Brisbane Airport at Skygate, opened in 2009 and has experienced five years of solid trading, including hosting close to 400,000 hotel guests, and has won many industry awards. 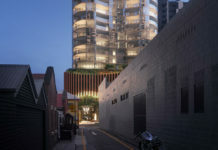 “The addition of our internationally recognised Accor-branded 5-star Pullman and 3.5-star Ibis hotels to the existing 4-star Novotel Hotel, will mean Brisbane Airport will have the full spectrum of fullservice branded hotel accommodation options covered, from quality affordable to upscale international,” Mr Flynn said. 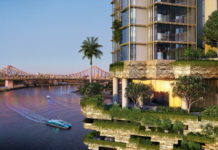 Designed by Noel Robinson, the hotels have been designed to reflect their distinctive identities and will be grounded in a lush, landscaped garden setting that responds to Queensland’s subtropical climate and transcends into the buildings themselves.